Costs – Tree maintenance and removal in Dallas, Texas takes more into account than just how tall or how round the stump is. Learn more about what the average costs for tree maintenance and tree or stump removal runs for, factoring in variables like power lines and age as part of the price. FAQs – Find out more about what the city of Dallas requires from its residents who own trees in terms of maintenance. 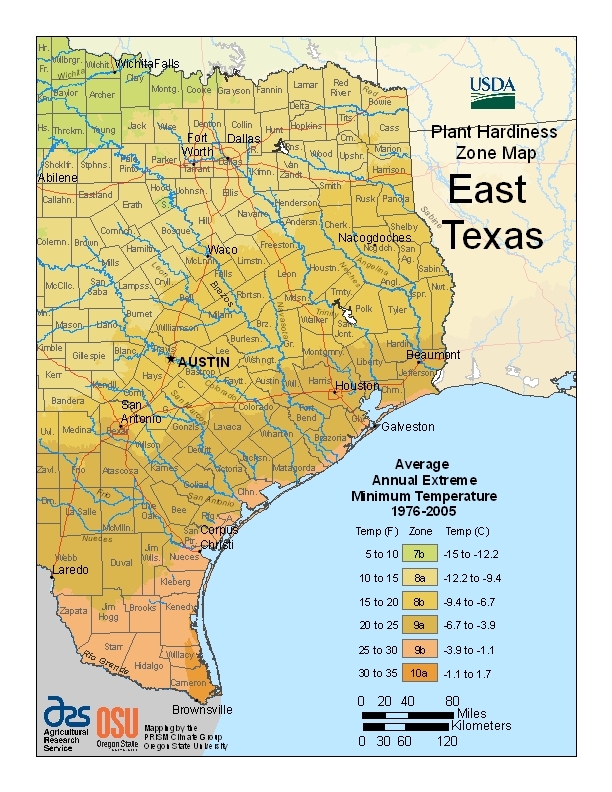 See what kinds of trees grow best in the eastern part of the state with a plant hardiness map by zone as illustration, and what insects to watch out for in case you decide to start growing trees in the area. Services – Interested in getting a few trees trimmed in the Dallas area but don’t know how to get started? Check out our list of professionals. How Much Do Tree Services Cost in Dallas? Tree service typically entails stump removal, tree removal or maintenance, such as trimming, pruning and cutting. There are a variety of factors that can affect the cost, but we’ve included below the average costs for typical tree services in Dallas, Texas. Different trees common to the Dallas region exhibit unique growth characteristics and propagation patterns. The amount homeowners spend on having their trees treated varies based on the age of the trees, locations and the type of work being done, ranging from $372 to $520. However, on average most spend around $446 for tree removal services. Services like stump grinding only cost approximately $80 to Dallas homeowners. This is because the stump actually remains in the ground, just low enough that grass is able to grow over it. Comparatively stump removal, wherein the entire stump is uprooted from the ground and hauled, will cost a bit more. Most Dallas homeowners spend an average of $325 for stump removal services. Dallas tree trimming, pruning and cutting costs $440, but expenses can vary from $377 from $503. This varying in price is accounted for by the type and number of trees Dallas homeowners have that need maintenance. Routine tree pruning can prevent many of the more expensive problems that occur when plants grow out of control. It’s also important to factor in things like a problematic tree’s proximity to power lines and buildings when trying to price a job. Taking care of Dallas property almost inevitably involves some form of tree management or shrub maintenance. Read on to learn about the considerations that homeowners typically deal with. According to the City of Dallas Parks and Recreation Department, most trees are the responsibility of whoever owns the property they’re growing on. This includes the removal of dead limbs that may fall and cause injuries. Trees on city-owned land and parkways may be removed by the city, but concerned residents and business owners generally have to contact City Hall and make a request. Property owners are also responsible for removing tree obstructions from adjacent public areas like sidewalks, streets and alleys. Trees that overhang sidewalks must leave a height clearance of eight feet, while streets and alleys require 15 feet of clearance. Trees near power lines are generally trimmed back by the utility company, Oncor, if they get any closer than 10 feet 4 inches within power lines. Many trees under lines are split down the middle with chainsaws, and this can occur with or without homeowner approval. Certain trees display different growth patterns, but most go into a dormant state as the fall weather brings colder temperatures. Removing trees when they aren’t growing as fast or producing sap is generally much easier. By contracting your tree services during such times, you may save a significant amount of money. If you time your tree removal right, you can also take advantage of the city’s Bulky Trash Program. Figure out when your bulky trash regularly gets hauled so that the trash service will remove your tree trimmings for free instead of you having to pay extra for the service. Which Trees are Popular and Grow Best in Dallas? In addition to the Texan state tree, the pecan (Carya illinoinensis), there are many different species that thrive in Dallas’s temperate climate. Local citizens plant trees on their property for many reasons, including shade, fruit or their desire to improve the aesthetic appeal of their property. Although trees like live oaks (Quercus virginiana) are extremely common and grow slower and slower as they age, such species can live for millennia. These evergreens spread their limbs out wide before they grow tall, which can make them difficult for people to manage. 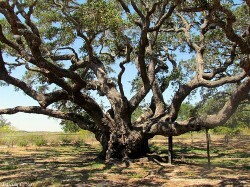 Other oaks, like the Lacey oak, post oak and bur oak, also grow to be some of the tallest trees in Dallas, but they’re often preferred over trickier live oaks. Smaller shade trees like the crape myrtle (Lagerstroemia) and desert willow (Chilopsis) are also popular for properties that don’t have much room. Popular trees in Dallas include the Texas mountain laurel (Sophora secundiflora) and Mexican buckeye (Ungnadia speciosa), both of which have showy appearances that really add visual appeal to properties. Trees like Eve’s Necklace (Styphnolobium affine) and Yaupon holly (Ilex vomitoria) are also favored for their natural appearances, but their shorter heights make them simpler to manage. Dallas property owners can also grow a range of fruit-bearing trees, like Mexican plum, Chinese pistache , crabapple, pecan and Osage orange. Remember that some of these species produce extremely messy fruit. Plan carefully before picking a final location. 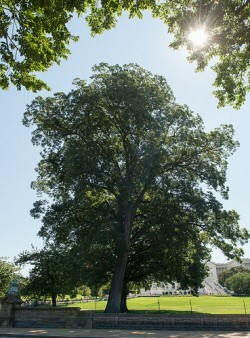 Like many larger trees such as oak, fruit trees often require a lot of sun. Oak wilt is a common disease in the Dallas area. This scourge primarily infects members of the red oak family, and it causes their leaves to become yellow or brown during the spring or summer. Some parasitic plants, like mistletoe, are relatively harmless when their growth is minimal, but they can easily pose severe threats to your trees later on. At high enough concentrations, mistletoe plants weaken root strength and wear at tree limbs, which can result in fall hazards. Insects like termites and other pests often spread from one tree to another. Mature trees that become infested may be beyond saving.